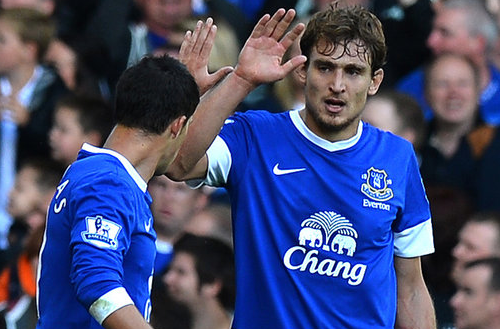 Nikica Jelavic was the quickest player to reach 10 goals for Everton for a century. He scored vital goals against Tottenham, Liverpool and Manchester United and became the first Croatian ever to win the Premier League Player of the Month award. He joined the Toffees in January for a relative bargain at £5m, and went on to become the club’s top-goalscorer that same season, despite only featuring for half a campaign. It looked as though Moyes had finally found the final piece of his decade long jigsaw, in the shape of a striker that would score the 20+ goals needed for Everton to reach the next level. However, under the weight of expectation, Jelavic has struggled hugely this season. Everton began well with some impressive attacking displays and goals were easy to come by as the Croatian netted four goals in the first six fixtures, including a brace on the opening day against Southampton. It looked as though Everton and Jelavic were all set to pick up from where they left off last season, but the striker’s form rapidly declined. The goals dried up and his most baron spell in front of goal on Merseyside lasted for twelve league games and almost four months until he came on as a substitute to seal a 2-0 victory against Manchester City with a deflected finish in injury time. The 836 minutes prior to that moment without a goal had a major effect on Jelavic’s ability to lead the line for Everton as the drought began to affect his overall performance. David Moyes was left frustrated as his central striker was often put through on goal, only to produce a loose first touch or scuffed shot capable of making Fernando Torres look confident. Moyes was patient with Jelavic and clearly desperate for him to rediscover last season’s prolific form, as it took seven games for the Scot to remove the forward from his starting line up. In recent weeks, Moyes has opted for Nigerian powerhouse Victor Anichebe to assume the role just in front of Marouane Fellaini. Anichebe is a target man whose game relies on hold-up play and ball retention, so his performances are rarely influenced by his ability to score goals. It was Anichebe who made way for Jelavic against Manchester City as the Croatian raced clear in the 93rd minute to fire a shot past Joe Hart with the help of a deflection from Gael Clichy. Jelavic ripped his shirt off and ran to celebrate amongst the fans in the corner of Goodison Park. The ensuing yellow card won’t have pleased his manager, but it was hard to begrudge the striker a passionate celebration after such a weight had been lifted. David Moyes will be hoping this is the goal needed to trigger several more as Everton begin their important run-in. Champions League football is still a serious possibility as they lie 4 points behind Chelsea in fourth place, and Jelavic will be influential if Everton are to have a successful end to their season. Jelavic still needs two league goals to match last season’s total. If he doesn’t achieve a higher goals total during his first full season in England, it will have been a wasted season for the former Rangers star, showing his manager a distinct lack of progression. He is still Everton’s major striking threat, and needs to start performing at a level that will take some of the goal scoring burden from team-mate Marouane Fellaini, who leads the statistics chart this season with 11. If Jelavic, Fellaini and Belgian winger Kevin Mirallas all remain at Goodison over the summer and stay fit throughout next season, Everton fans should have a great deal to look forward to providing David Moyes signs a new contract. and so do I. His presence has in no way provided a foil for Jelavic, it’s just changed the way we play, we’re less fluid, Jela was feeding off of accurate low drag backs into the box last term. That hardly ever happens now. At the moment, we pump the ball up to Fellaini so he can chest the ball down and try to build from there. Jela doesn’t work with flick ons, he needs an actual partnership with a capable ball playing midfielder or another striker like Anichebe. I think when Fellaini goes this summer we’ll see better from Jela without a roadblock in his way, and I for one am very eager to see how we set up the next two games without Fellaini. I hate to use a single source, but it just saves me time. I believe this all makes a lot of sense. I don’t think it’s the striker, I think it’s the system.